The Windows Blue operating system update is likely to be named "Windows 8.1" when it arrives this summer, according to sources. Microsoft officials supposedly have decided on the final name for Windows Blue. The final decision, one of my sources told me, is that it will be Windows 8.1. The client version of Blue, codenamed Windows Blue, is a refresh of Windows 8. It is expected to be released to manufacturing around August of this year. As I've blogged a few times, Microsoft is planning to position Blue as part of the Windows 8 wave, not as Windows 9. On Twitter this morning Roman L. (a k a @AngelWZR) posted a screen shot of what appears to be a build of Windows Blue that postdates the one that leaked a week ago. The week-ago Blue build was 9364; the new one is 9375. It is labeled in AngelWZR's screen shot as "Windows 8.1 Pro." "Well maybe that's not an April Fools' joke," AngelWZR tweeted. My Blue source said that the top-level branding will be "Windows 8" when Microsoft releases the 8.1 update -- similar to the way that Microsoft's Windows Phone officials talked about the "Mango" (Windows Phone 7.5) release as part of the Windows Phone 7 family. My tipster also says that Microsoft plans to refer to the Blue update for Windows RT as "Windows RT 8.1." There's no word as to what, if anything, Microsoft plans to charge existing Windows 8 and Windows RT customers for Blue. Microsoft executives like Windows Chief Financial Officer Tami Reller have said repeatedly that Microsoft envisions Windows 8 as something more than a one-season wonder. Reller has said the company considers Windows 8 a product "of multiple selling seasons." 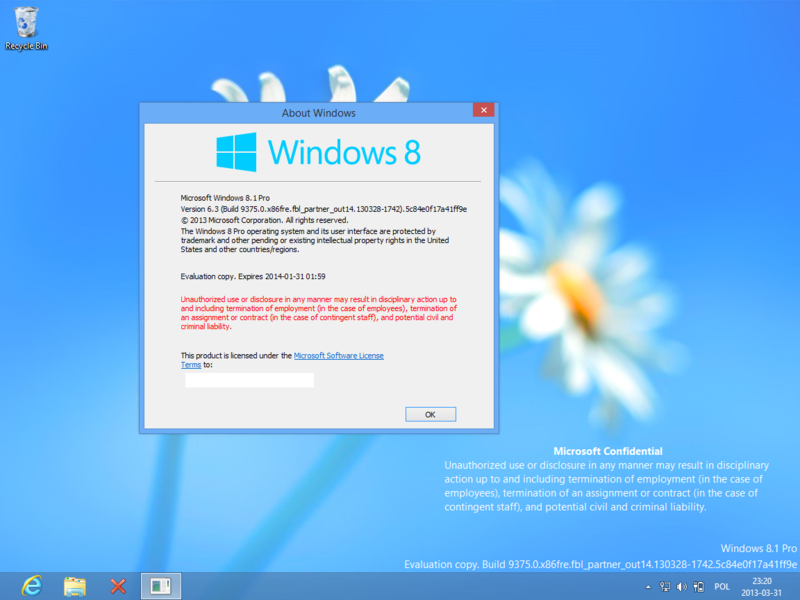 So it makes sense that Blue would be christened Windows 8.X, not Windows 9. If it pans out that Microsoft has, indeed, opted for Blue to be named 8.1 -- rather than 8.5 or 8.7 -- I wouldn't be surprised to see the expected next couple of annual Windows client refreshes to also have an 8.X name when they roll out over the next few years. Microsoft officials are not commenting about Blue, beyond acknowledging that the code name refers to the next wave of products from the company. This story originally appeared at ZDNet under the headline "Microsoft's Windows Blue looks to be named Windows 8.1."